Very charming and I love your photo! I now have 'Magic Bus' by The Who playing in my head, lol. Reminds me of the old car on the Big Sunny trail on Mill Mountain. I think the city even put a sign there like a tourist attraction. That would make a good chicken coop, just a little work and maybe move it up beside your house, lots of possibilities. I am sure kids would love to play in it. A chimney, wow! That was some serious off grid living, once upon a time! I've thought about using a bus as a storm shelter- burying it partly...I think I saw that somewhere on pinterest, maybe. It would also make you a nice root cellar...if you have the equipment to dig a deep enough hole. Great ideas for a vintage bus - BUT I hate to think about the critters living in there! Be careful of snakes, dangerous spiders, and perhaps even larger animals!!! Hope the mountains are providing beautiful Winter scenery - we still have not had a real snow down here, and are now tired of ice storms! Road trips are on stand by for that bus. You turned lemons in to lemonade. Appreciating it's interest instead of thinking of it as an eye sore. I can't imagine someone actually living in it. That's crazy! oh i love it...i've never seen a chimney on a bus before! I feel the very same way about seeing it, and I'd visit it and take photos and wonder about the stories it could tell! I don't know what is about abandoned things like that, they always draw my attention in, and I'm happy for the chance of seeing them. Thanks for sharing. That old bus is really charming there... Bet --if IT could talk---it would have some great stories to tell. I think it has some charm too,, kind of like art. Its kinda pretty! I love it! Pictures like this make me happy. It looks quite spooky to me! I like the color...it does have charm. And I'm guessing a raccoon or two uses it as their home. I wouldn't be surprised if it served Trailways at one time. If you get a look at the brand badge on the front and Google it, you might find it. I believe it is a bus manufactured in the 1950's. 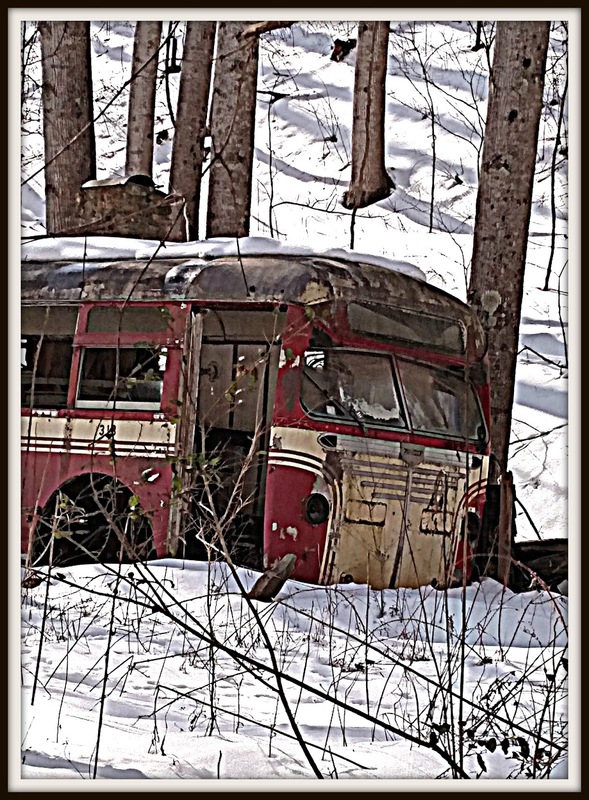 The bus looks charming sitting there in the snow. It sounds like it has definitely become part of your history (at lease for the last 16 years). I'm always intrigued by the abandoned places. Plus what a cool old bus!